Coffee or tea? To be or not to be? Middleborough or Middleboro? Ah yes, the world's eternal questions. So what is the difference between Middleborough and Middleboro? Is the latter simply the "ignorant" version of the former as Wiktionary would have us believe at least in the case of Marlborough and Marlboro? Actually, it's a little more involved. In 1669 when Middleborough was incorporated as a town on June 1 of that year, it was actually incorporated as "Middleberry". "Namassakett shalbe a township, and to be called by the name of Middleberry ..." [Plymouth Colony Records, Volume V, page 19]. The pronunciation of "Middleberry" probably sounded very much like "Middleborough", a name which clearly indicated the geographical location of the new town (or borough) midway between the English settlement at Plymouth and the Natives at Montaup (Mount Hope) in present-day Bristol, Rhode Island. And so, for over a century, Nemasket was known solely as Middleborough and the name was spelled as such. People being people however, in time they simply got tired of writing the name of the town fully and they contracted the word. So just as does not became doesn't with an apostrophe inserted to indicate that something was missing (in this case the "o"), so too with Middleborough which became Middleboro' with an apostrophe at the end indicating that the "ugh" had been lopped off. While it's not recorded when people first became economical with the spelling of the word Middleborough, handwritten spellings of Middleboro' as early as the late 1700s are known. The practice, however, truly took off during the 19th century when Middleboro' abounded. Middleborough's most important manufacturer of the 1850s was known as the Middleboro' Steam Mill Company and so spelled its name, apostrophe and all. After awhile however, even the practice of placing the apostrophe at the end of the word began to wane, and Middleboro' became Middleboro. Middleboro as a spelling was considered by many as contemporary and modern in contrast to Middleborough with its silent "ugh" at the end which was regarded as archaic and orthographically senseless. The effort to dispose of "ugh" was not particular to Middleborough as a town or as a word. Several "boroughs" throughout Massachusetts (like Marlborough) similarly abandoned their final three letters, while spelling reformers at the time also sought to permanently retire the combination from certain words. Most conspicuous was the word though which shared the same evolutionary experience as borough being first written as tho' and finally as tho. In 1879, Joseph Medill, the owner of the Chicago Tribune and a spelling reformer, required that writers for his newspaper adopt tho as the proper spelling along with a host of other words. So, while Middleboro' fell off the face of the spelling map, Middleborough and Middleboro have remained to be used interchangably since the mid-19th century - one adhered to by traditionalists and the other by reformers and modernists. Consequently, we have the curious and somewhat confusing anomaly of residing in the Town of Middleborough but reading the Middleboro Gazette. Top: Detail, I. H. Harlow & Co., advertising card, c. 1870, paper. Harlow's was the successor firm to the Middleboro' Steam Mill Company, and like the steam mill, Harlow preferred the apostrophized spelling. Bottom: Ebenezer W. Peirce, "History of Middleboro'" in D. Hamilton Hurd, History of Plymouth County (Philadelphia: J. W. Lewis & Company, 1884). 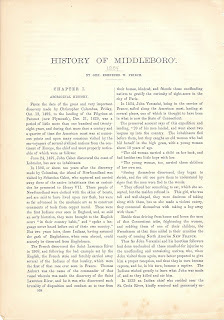 For his 1873 history of the town, Peirce employed the spelling Middleborough. By 1884, he had progressed to Middleboro'. Interesting discussion of the Middleboro/Middleborough spelling--I've been wondering about this since I began tracing my family roots back to Middleboro ugh. I vote that we go with Mboro. It's economical and will save me a ton of Internet ink. Middleborough is the name of the town. Middleboro is where you might live. Your mail is delivered to you by the Middleboro post office. I just call it "The 'boro".